WE'RE SMALL, RELAXED AND DIFFERENT. WE LIKE IT THAT WAY AND WE THINK YOU WILL TOO! PLEASE STOP BY ON SUNDAY TO SAY HELLO. Our Pine Creek Presbyterian Church is a very unique family of friends. 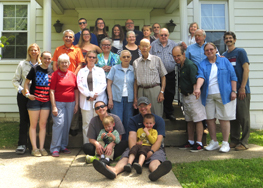 Because of our smaller size, each member of our congregation has the opportunity to play an active, hands-on role in each service (see the the Photo section). We have arranged our pews in an intimate 'U' shape pattern to engage all who attend (see the photo below). When you drop in to visit us, you will see children passing the offering plates, the organist also singing in the choir, the auditor decorating the doors, the elders gardening, a family hosting lunch after the service, etc. Rev. 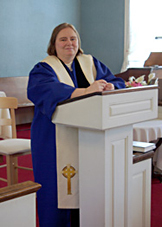 Diana Harbison has been a minister for 27 years at Pine Creek Presbyterian Church. For more information about Rev. Diana, please see the Contact section. 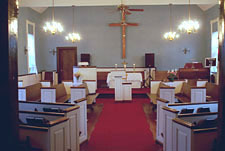 The Pine Creek Presbyterian Church is located in the Fox Chapel Area of Pittsburgh, PA in Indiana Township. It is in a quiet, tree-lined northern Pittsburgh suburb. The Church became the center of the community in 1815 and was originally located in the center of the Pine Creek Cemetery until 1894. The interesting story, complete with old photographs showing how the Church came to its current location two miles away from the original site, is available by selecting the History Since 1815 section. The Pine Creek Presbyterian Cemetery is owned and maintained by the Church. One of the early visible birth dates on a headstone in the cemetery is 1775. See the Contact/Directions section for the location and map of the Pine Creek Presbyterian Cemetery and links to other related websites. Summer-time light refreshments, an extension of our fellowship, is kindly served in the lower level around 11am, or when we conclude the 10am service. Hope to see you there!